I was trying to sort thru some old photos on my computer today when I came across a few I didn’t even remember taking. Also, about 20,000 pictures of my kids. Wow. It’s a wonder they aren’t blind from all the flash bulbs going off in their faces. I apparently took pictures of food well before I decided to start a blog as there were a random recipe photos sprinkled throughout the birthday parties, first days of school and family holiday get-togethers. It’s no wonder. The food at events has always been almost as important to me as the people. Almost. 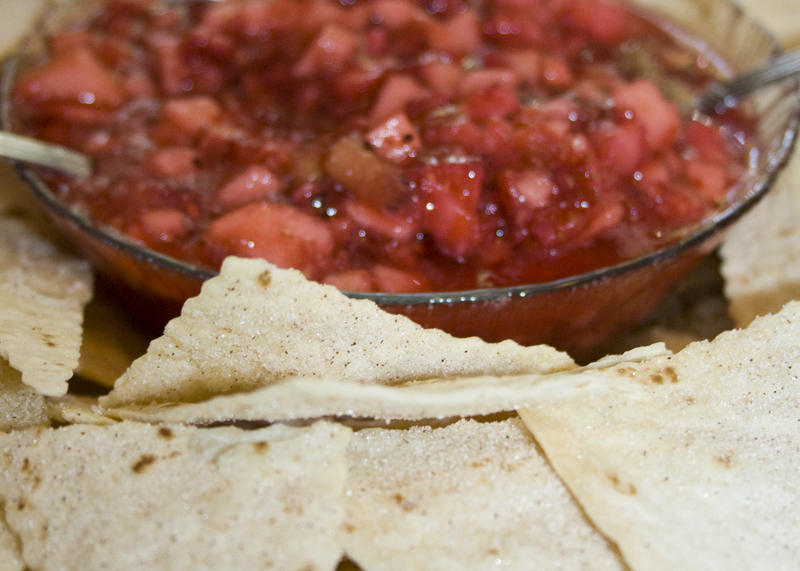 I made this fruit salsa when I hosted a baby-shower for my sister-in-law. I remember it was awesome. And that in the midst of all the other deliciousness I made that day, the salsa and chips disappeared the fastest. Maybe because the day Anna chose for her party ended up being about 100°. Which might not be unreasonably hot in your neck-of-the-woods, but Seattleites are sure they’ve gone to Hades when it’s that warm outside. This salsa is bursting with cool-off fruity goodness. Paired with the sweet crunchy cinnamon chips, it is incredible. Chop up the apples last when you make this, that way you won’t be cutting up anything else while your apples go brown. 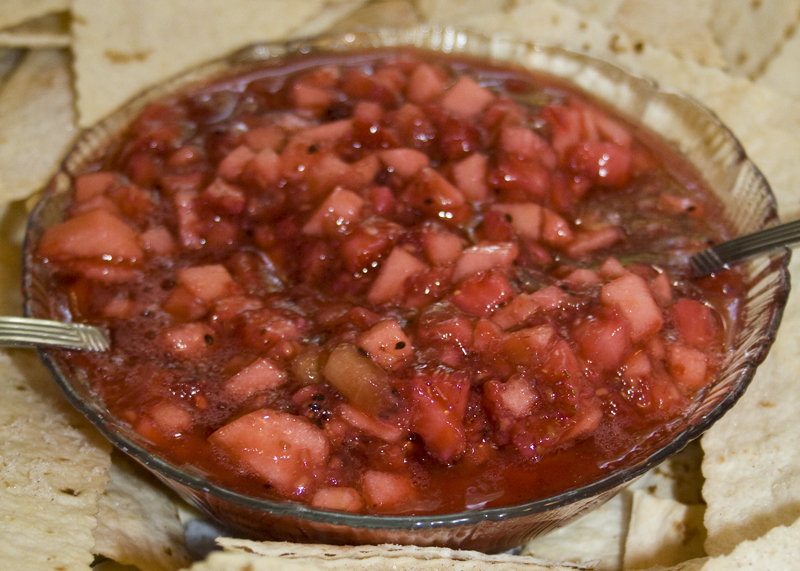 I used strawberry preserves (I think) when I served up this salsa. It would be just as good with raspberry or even orange marmalade. Yum. Another thing I noticed as I perused my dozens of folders full of memories is that I’ve become a much better photographer in the past few years. I’m not saying I’m ready to give Annie Leibovitz a run for her money or anything, but the stuff I shoot now is certainly more drool-inducing than these. Sorry. The salsa is just so good I have to give you the recipe. But it’s not exactly fresh fruit season (hello January) to enable me to make up another batch to get good photos of the process and end result. I hope you will forgive me. I’m an impatient person. I can’t wait to share good food. In a large bowl, thoroughly mix kiwis, Golden Delicious apples, raspberries, strawberries, sugar and fruit preserves. Cover and chill in the refrigerator at least 15 minutes. 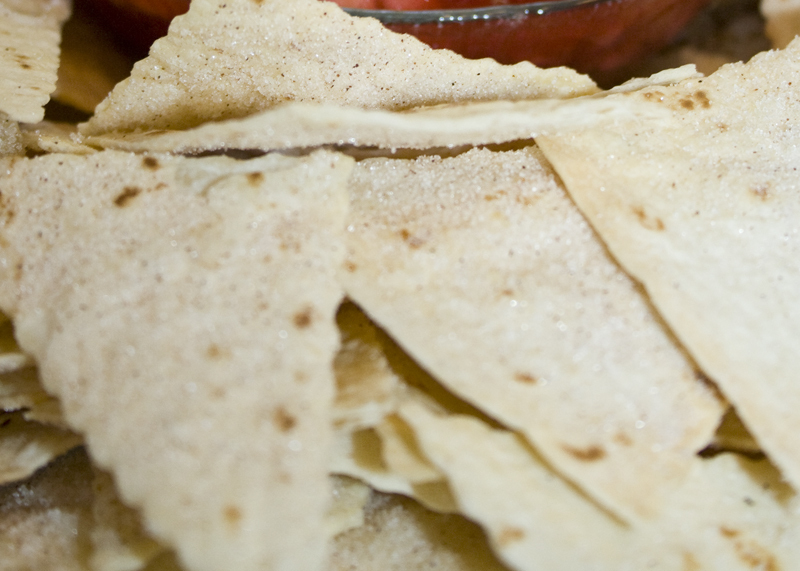 Coat both sides of each flour tortilla with butter flavored cooking spray. Cut into wedges and arrange in a single layer on a large baking sheet. Sprinkle wedges with desired amount of cinnamon sugar.